Weekends are exciting time for me. I love to sit at my backyard deck for a hot breakfast or an afternoon tea. Not only do I enjoy a meaningful conversation, I indulge myself with peace and serenity this nature offers to me. I have learned that Eastern Bluebirds used to be endangered birds. Due to the use of pesticide and the nesting site's competition with House Sparrows and European Starlings, Eastern Bluebird's population declined seriously in the mid of twentieth century. 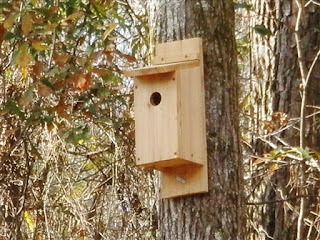 With the installed nesting boxes by the enthusiastic birders, this species was saved from extinction. I have noticed few Eastern Bluebirds live around my backyard. I suggested few friends about making a Bluebird house. They asked me “how do you know if other birds would not use the nesting box?” I really don’t know. But one thing I do know is by making the correct measurement of the box and the size of entrance opening, the smart Bluebirds hopefully, will visit my box. 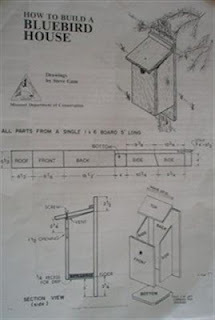 One afternoon, my good friend, also an architect, decided to make a “testing” Bluebird house and just to see if my theory was correct. I don’t know what he thinks in his mind. Whatever he thinks, he smiles to me and says “let's see if we can make you a Bluebird house”. My job is to bring him a piece of cedar wood (size 6 inches x 6 feet,bought from Home Depot) and the measurement for the box and take pictures, as always. I have researched for a while and find this simple house plan that is easier to make. I have prepared this list as followed if you want to try it at home. 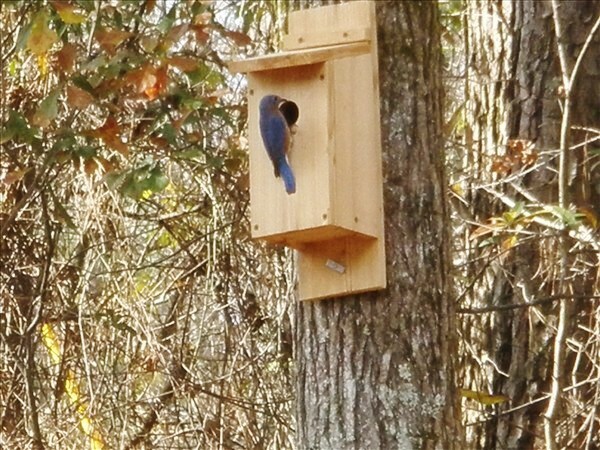 It only takes about an hour to complete the construction of the Bluebird box. Drill the Front to 1 ½” inch wide entrance hole. I would like to make a note here that if you don’t have a handy electric drill with attachment, use other drill you have. Cut a smaller hole first and use a wood chisel gnaws at the hole until it becomes the right size. Either way you choose, make sure you use sandpaper to polish the hole to a smoother opening. 4. Nail the 2 Sides to the Back first, and then nail the Bottom and Front. I would like to note here if you forget to drill the beveled corners, you can drill 4 small holes for drainage (not bigger than ¼” or snake might get into the box). Also pay attention when you nail the Front piece to the Sides. The front edges of the two Sides are 1/8” shorter then the Front piece when nailing them together for the purpose of ventilation. 5. Mount the Top piece to the Back with a holding-down wood strip (¾” x 5½”) for the roof. Another alternative way is to mount the Top to the Back on a hinge. 6. Nail a small frame hook to the back side of the BACK piece and your Bluebird House now is ready to be installed. 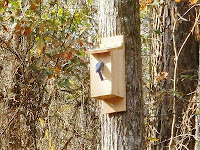 Mount your Bluebird box at least 4 to 6 feet above the ground on a metal or wooden post. If you have a lot of trees around your yard, mount your box to the nearest tree so you can enjoy watching your birds. Make sure face the entrance of the box to an open field and the back of the box to the woods or trees. If you put out more than one box, make sure they are at least 100 yards apart since bluebirds are territorial. 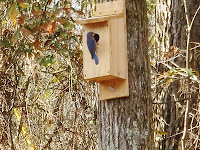 Clean boxes: Bluebirds start nesting in March and they will look for the nesting place in February. So it’s a good idea to clean the Bluebird house in fall or Janurary. Bluebirds normally have 2 to 3 broods a year. So clean the boxes as soon as the fledglings leave the nest. Adult birds will most likely reuse the same box for the next brood. I put up my first Bluebird box in the Saturday afternoon and it took us a while to secure the box to an ideal location where I can sit and watch the bird’s activity from my deck. The very next day morning(a sunny Sunday), while I was cleaning the leaves from driveway, three Eastern Bluebirds were around the box. One male Eastern Bluebird came to investigate this newly built house and then he was gone for few minutes and returned with his beloved mate. Two birds sat on a tree branch above the box chatting for a while. Female flew to the box and checked the house carefully. I insanely took as many photos as I could. I hope they like the "house" we built for them and will start their family here. I will keep everyone updated with their activities. Final note: one more thing, it is not necessary to paint the box. If you want to paint the box, make sure you only paint outside of the box. Personally, I think wild birds love natural material and the "man-made" nesting place should be as close to the nature as possible. Please also remember to clean up the nesting box once young birds fledge because Bluebird will reuse a clean box. 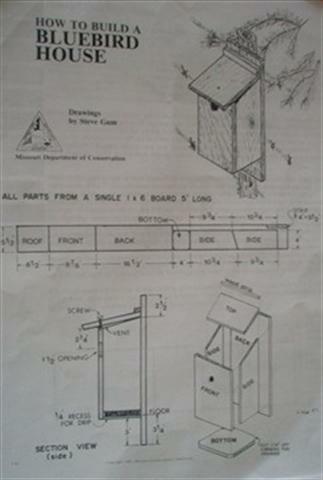 Visit Missouri Department of Conservation for the detailed Bluebird House plan. 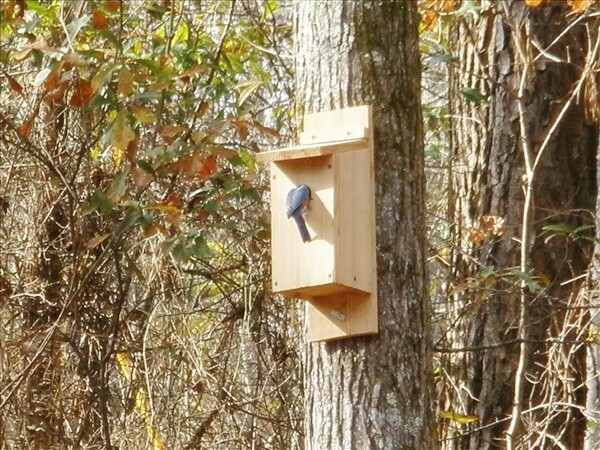 Email me if you have any question making the Bluebird box. Have fun!